U.S. Transportation Secretary Ray LaHood and Consumer Reports have put attention back on an important safety issue by announcing a partnership to help prevent car accidents by teens driving while distracted and texting while driving. They released a poll that shows how widespread the problem remains, even after many states have adopted graduated licensing laws that ban teens from texting while driving or using cell phones in any capacity behind the wheel. Among those polled, 63 percent of people under 30 said they have used a handheld phone while driving. Thirty percent admitted to texting while driving. Only a third said they feel such behavior is very dangerous and could cause motor vehicle accidents or pedestrian accidents. Those rates were higher than for drivers over 30. 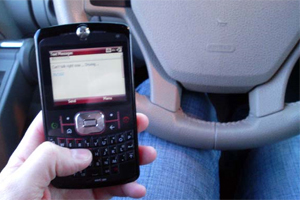 Among those respondents, 41 percent admitted to using a cell phone while driving. Nine percent had texted while driving. A 2009 study by the Virginia Tech Transportation Institute shows the risk for a car accident is 23 times greater when texting while driving. The study was financed by the Federal Motor Carrier Safety Administration. Set a good example and put away your own phone in the car. Some 40 percent of young people ages 12 to 17 say they have witnessed a driver using a cell phone in a way that threatened to cause a motor vehicle accident and result in personal injury. Talk to your teen. Tell your teen it’s important not to use the phone or text while driving. Show them statistics about car accidents caused by texting while driving. Establish driving rules and sign a pledge. Let your teenager know what you expect from them while driving. Put not using a cell phone while driving at the top of the list. Tell your teen what the punishment will be if they break the rules and have them sign a written contract to reinforce your message. And remind them they may face other penalties. Many states, such as Massachusetts, have graduated licensing laws that ban drivers under 18 from using cell phones while driving. Under Massachusetts’ Safe Driver Law, drivers under 18 face a 60-day license suspension if they are caught using a cell phone behind the wheel. They must also pay a $100 fine and take an education class. The penalties increase for subsequent offenses. To read the “Distracted Driving Shatters Lives,” brochure, click here. The Boston car accident lawyers at Breakstone, White & Gluck have over 80 years combined experience handling accidents on Massachusetts’ roadways, including motor vehicle accidents, pedestrian accidents, truck accidents and bus accidents. If you have a case, contact us today at 617.723.7676 or use our form.